Private View: Sunday 5th February 2016, 11am – 4pm. The Exhibition continues until Saturday 25th February 2017. In this exhibition — held in association with London’s Redfern Gallery — over a third of the works are prints. William Gear’s print-making flowered from 1949 (the chronological starting point) to 1972, between which dates he produced 49 separate editions. More than 20 of them are on show. During his Paris sojourn (1947-50) he contacted the lithographer Jean Pons, whose address turned out to be a ladies’ dress shop. But on entering the premises my father’s request to see Monsieur Pons might have constituted a secret password. The proprietress swept aside a rug on the floor, lifted a trapdoor hidden underneath, and called down to the men in the atelier below — a former clandestine printing works used by the War-time French Resistance. 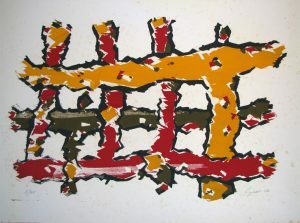 One of the lithographs he produced there was Black Element 1950, an interestingly significant work because of its noticeable cross-references to visual elements found in his contemporaneous paintings. But he felt rather restricted by the necessary collaboration with lithographic technicians, and produced no further lithographs after 1957. However, since the 1930s American artists had used the medium of silkscreen printing, and he became struck by its potential. In 1952 came the opportunity to try it, when he scavenged the necessary parts to construct a rudimentary silk-screen frame, even if the material used was not real silk, but some organdie cotton cut from one of my mother’s old dresses. It was thus that William Gear became one of the pioneers in Britain to experiment with silk-screen printing. 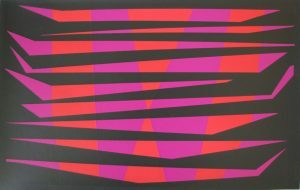 Historically revealing is the fact that when he first showed examples (eg Orange/Black 1952 and Trellis 1952) to London’s Redfern Gallery, it was initially reluctant to accept screen-prints as a ‘valid artistic medium’. During the mid-1950s he experimented with relief printing, Still Life 1955, and Imposition 1956 being especially redolent of the period’s visual zeitgeist. By 1958 he had returned to screen-printing, such works as Coast 1962 influenced by the moods of the Sussex seaside nearby. Other works offer more obvious examples of media ‘cross-fertilisation’, eg Spike 1969 and Dagger 1971, both of which bear ready comparison with oil paintings of their period. It’s worth emphasising that all William Gear’s print editions are genuinely ‘limited’, as the norm was 25 or fewer. In fact some editions are now even more ‘limited’ than when produced, as a few prints were ‘lost in overseas action’ after their purchase by the British Council. Its archive records, for example, the fate of a 1949 lithograph as eaten by ants in Pakistan — indicating that at least Commonwealth insects had good taste. As well as a visual revelation to many, it’s hoped that the prints on show will constitute a tempting precursor to the proposed Catalogue Raisonné of William Gear Prints, to be collated by the Redfern Gallery in its role as core handler of the Artist’s Estate. Finally, I should mention that during the exhibition, copies of Andrew Lambirth’s magisterial new biography of my father will be available to purchase.